The New Phone Books Are Here! So damn grateful for the kindness of reviews. It seems like a little thing, but to all of us who put our works out in the world, it is actually all the things & a bag of chips with a cherry on top. Not counting Amazon sales (which is the only thing Amazon counts… They don’t count the 1k+ books I’ve bought (from them) and sold from the trunk of my car on my travels around the country, solo or with The Grace Project.) I have personally looked into the eyes and put over 1000 books in people’s hands. True, I’ve only sold about half those. The others I have used as thank you cards to my gracious hosts in my travels around the country/world; I have donated to many friends of friends who have been diagnosed with breast cancer and I couldn’t bring myself to charge them on top of what they are going through; I’ve sold them at my book release parties and other book events like the #Milford Readers & Writers festival, my library’s local author book fair, and other events and appearance, or foundations have asked me to donate books to their fundraisers and I always do. –My point is not to Pat myself on the damn back or anything here. Patting yourself on the back never feels quite as sweet as somebody else patting you on the back. My point in opening my vein here, is cuz I don’t know how else to properly express the depth of gratitude I’m feeling to hit the milestone of 100 reviews. Last week I had a conversation with somebody who challenged my legitimacy as an author cuz I’m self published and they wondered if anybody but the hubcap has ever bought my book. Kinda sent me spiraling. I did not leave my house the next day, even called in sick to occupational therapy for my #write hand. After laying around the house all damn day I still couldn’t sleep that night. After scrolling through Facebook like a prayer list as I am won’t to do in the middle of the night, I ended up clicking onto my Amazon Shaken Not Stirred . 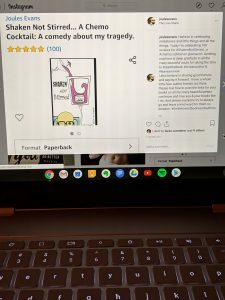 . . a Chemo Cocktail page and read through every single review sending out mad love and gratitude to all those crazy beautiful souls. 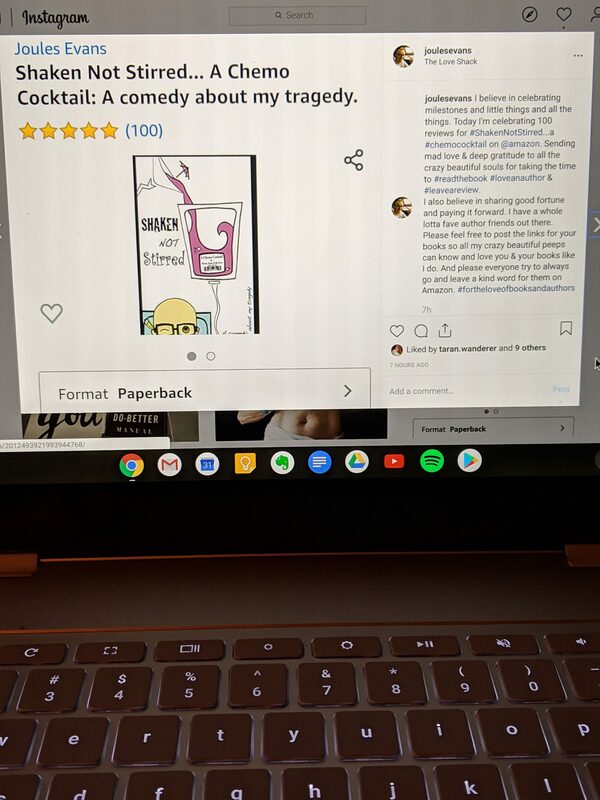 I’ve recently realized what a miracle it is to get Amazon reviews at all, since over the years I’ve had various people I’ve personally handed books to in my travels around the country contact me saying they tried to give me a review but Amazon won’t accept it cuz they aren’t a verified purchase since they bought one at an event or outta the trunk of my car. And they always take down any reviews from friends and family. I get that, kinda? but I also don’t. The hubcap & redheads all wrote reviews I thought anybody looking for a cancer memoir would find helpful since they lived through it too. It wasn’t just my story. They weren’t just gushy sweet nothings but thoughtful reviews. But Amazon took them down. Whatever. Back to my point. Bowing down in gratitude. It truly is one of the best ways to love your fave authors.